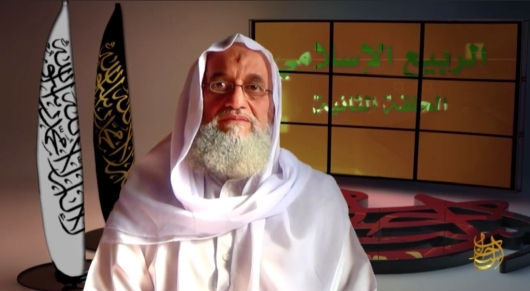 Al Qaeda’s chief Dr. Ayman Al Zuwahiri began his jihadist career in the radical Egyptian Islamic Jihad movement, which despised the Muslim Brotherhood and its political aspirations on religious and ideological grounds. Twenty years ago, Zuwahiri embraced the brand of Egyptian Salafisim created by Sayyid Qutb, a philosopher, writer and poet (1906-1996) and made it the guiding light of contemporary Al Qaeda. Qutb hated all things American, reviling American society and culture as obsessed with materialism, violence and sexual pleasures. Adulated by his followers as a great thinker and martyr for Islam, Qutb was convicted in 1966 of plotting to assassinate Egyptian President Gamal Abdel Nasser and executed by hanging. The part of the Qutb philosophy that naturally appealed to the Al Qaeda chief was the contention that mainstream Muslims were guilty of forsaking the fundamental Muslim commandment of jihad, an omission which the organization he led was dedicated to correcting. This week, he broadcast an invitation to Muslim Brotherhood leaders to sit down with him and read together the writings of Sayyid Qutb. He promised that once they saw the light, they would find a way out of their abject situation. In today’s Egypt, it is proscribed as a terrorist organization and its activists hunted down. The Brothers are fast losing any popular support they once enjoyed on home ground and, apart from occasional violent attacks on El-Sisi regime targets, are too tied down for effective opposition..
Saudi Arabia and the United Arab Emirates have vowed to fight the Brotherhood to extinction; Jordan sees the Muslim Brothers as enemies of the throne; the Assad regime in Syria has historically hounded the Sunni Brothers as enemies and, today, the Syrians and the “rejectionists” (Al Qaeda’s appellation for Shiites, like Hizballah and the pro-Iranian Shiite militias) are out to wipe them off the map. The only country offering them sanctuary is Qatar, which partly accounts for the multiple Arab boycott of the emirate. The only way out of the Brotherhood’s sorry state, Zuwahiri maintains, is to throw in its lot with Al Qaeda and adopt its jihadist agenda. He explains how this partnership would work: “We have the operational experience (for terrorism), the intelligence resources and the professional commanders, while you have the manpower to support joint missions,” he says. He points to Syria as the right place for kicking off their concerted campaign, since both their organizations run active combat personnel there and possess the necessary weaponry and motivation. Zuwahiri referred specifically to the Nusra Front-Al Qaeda in the Levant. This group is not an autonomous entity as its commander Abu Mohammad al-Julani pretends, but closely tied to Al Qaeda. Then, too, many of the Sunni Islamist militias fighting the Assad regime Syria are closely identified with the Muslim Brotherhood and is tenets. Al Qaeda’s chief plans to capitalize on the Islamic State’s serious setbacks on the warfront to boost its profile in Syria, say DEBKA Weekly’s counterterrorism sources. In his bid to court the Muslim Brotherhood as his partner-in- terror, Zuwahiri is ready to virtually write off as a goner Al Qaeda’s main rival, the Islamic State which, he contends, has been forced to withdraw much of ISIS’ fighting strength to isolated locations in southeastern Syria and western Iraq.